The Return Of The King - 1960. 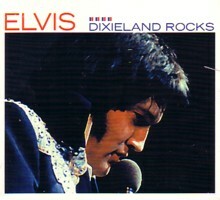 Elvis Presley left the army 50 years ago this week, to suggestions that the music he pioneered had died in his absence. 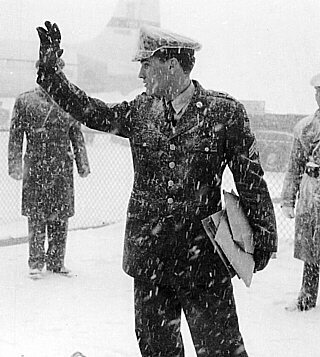 On the morning of 3 March, 1960, after a flight from Germany broken by a refuelling stop at Prestwick Airport, 30 miles south of Glasgow (the only time he set foot in Britain), the DC7 jetliner carrying Elvis Presley landed at McGuire Air Force Base, New Jersey, amid the remnants of a light blizzard. The truth turned out to be a little different, - by Richard Williams from the Guardian. 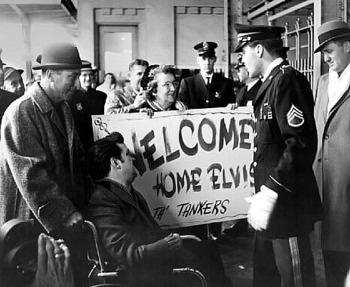 Forty-eight hours later, Presley was given just over $100 in "out pay" – for travel, food and clothing – and, at the age of 25, discharged from the US Army, his two-year commitment fulfilled. Elvis had been waved off from Wiesbaden by Priscilla Beaulieu, the 14-year-old stepdaughter of a US air force colonel; he was met and escorted away from military life by Nancy Sinatra, the 19-year-old daughter of a man who had once described Presley's music as "a rancid-smelling aphrodisiac". 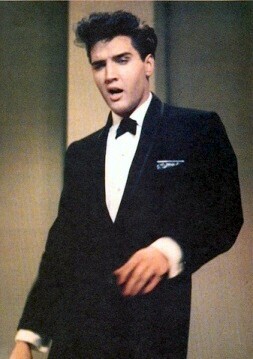 On March 7th at 7.45am Elvis arrived home to Memphis, where old girlfriend Anita Wood was waiting patiently for him. By the start of a new decade, however, Frank Sinatra had given up trying to repel the forces of rock'n'roll, whatever his private feelings. 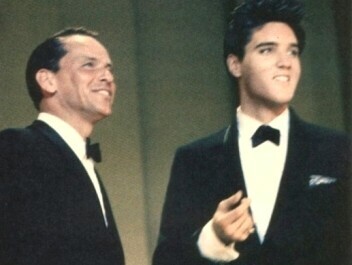 And if you couldn't hold back the future, he may have thought as he sat in his suite in the Fontainebleau hotel in Miami Beach, waiting for Elvis Presley to arrive, you might as well make money from it. Presley's first professional commitment in his new civilian life was to spend two days in a studio in Nashville, recording material to be rushed out for sale to the 1,275,077 people who had placed advance orders for his new single while he was still in Germany, before the songs had even been selected. Once that task was complete, he, his musicians and his manager, Colonel Tom Parker, boarded a train that would take them, with frequent stops to greet crowds of fans carefully alerted in the small towns of half a dozen states, to Miami, where he would perform both sides of his new single, Stuck on You and Fame and Fortune, as the guest star on Sinatra's regular television show, which had been retitled for this special edition: "Frank Sinatra's Welcome Home Party for Elvis Presley." Seventeen years later, when told of Presley's death, John Lennon – who had once proclaimed, "Before Elvis there was nothing" – spoke for the purists when he said: "Elvis died the day he went into the army." 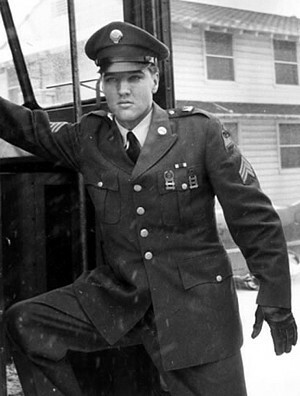 And even Presley seemed to agree that his early rock'n'roll incarnation had been consigned to the past when, barely out of his 32nd Tank Battalion uniform, he told a reporter from Life magazine: "I want to become a good actor, because you can't build a whole career on just singing. Look at Frank Sinatra. Until he added acting to singing, he found himself slipping downhill." The reporter added his own verdict: "He is now a decent, God-fearing, country-loving all-American. He tells reporters he will sing rock songs only if his fans want to hear it." Thus was Presley's metamorphosis from tearaway to all-round entertainer apparently confirmed. He was bound not for glory, but for Hollywood, and the endless wasteland of such movies as Blue Hawaii, Kissin' Cousins, Roustabout and Girl Happy. Never lacking self-awareness, he recognised his plight as early as 1962, when he told a reporter from Parade magazine: "I have people say to me all the time, 'Why don't you do an artistic picture?' I would like to, I'd like to do something someday where I feel that I've done a good job as an actor in a certain type of role." But Colonel Parker had plotted a path that honoured sensible showbusiness precedents, and would provide the comforting promise of an extended career structure to legions of young rock'n'rollers whose managers never expected the fad for the music to outlast their proteges' teenage years. Rumours of the music's imminent demise had circulated among Tin Pan Alley cynics ever since Bill Haley's Rock Around the Clock had hit No 1 in May 1955. And four incidents that took place while Presley was doing his military service suggested that its time might already be up. 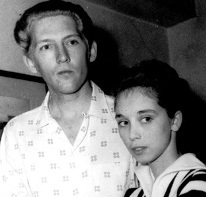 First, two months after Elvis was drafted in March 1958, came the notorious British tour during which Jerry Lee Lewis, still hot with Great Balls of Fire and one of the performers tipped to usurp Presley, was unmasked as having undertaken a bigamous marriage to his 13-year-old cousin. "Age doesn't matter back home," a chirpy Myra Lewis told reporters. "You can marry at 10 if you can find a husband." But Fleet Street felt it had revealed the true libidinous decadence of this ghastly teenage music, the tour was cancelled and Lewis's career never fully recovered. Chuck Berry, Jerry Lee Lewis, Alan Freed - disgraced Rock'n'Roll Heroes. The lights dimmed further when the private plane carrying Buddy Holly, Richie Valens and The Big Bopper crashed in Iowa in February 1959. Holly, although only 21, had already suggested ways in which the music might expand itself and thrive. But somehow his demise underlined the belief – fostered by Rebel Without a Cause and the popularity of such "death discs" as Endless Sleep and Tell Laura I Love Her – that rock'n'roll and the cult of the teenager might be a thing of short life, and short, doomed lives. There were also more earthly problems. 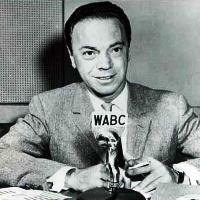 That October, the pioneering disc jockey Alan Freed was forced to resign from the powerful New York radio station WABC upon being accused of accepting inducements to play records on the air. At a live show a year earlier, Freed had been charged with incitement to riot after telling his young audience: "The police don't want you to have fun." The Payola scandal gave the authorities their revenge. 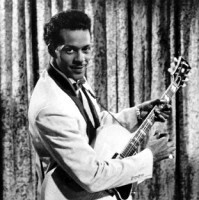 Found guilty of accepting bribes, Freed was given a fine and a suspended jail sentence, and his name no longer appeared on the songwriting credits of Chuck Berry's Maybelline, from which he had received royalties in return for plugs. His career was ruined. The fourth nail was hammered into the putative coffin in December 1959, four months before Presley's demobilisation. It was on a visit to Juarez, Mexico, that Chuck Berry, the most influential of all African-American musicians on the new generation of white would-be rockers, met a 14-year-old Apache girl whom he invited to work as a waitress at his club in St Louis, Missouri. Later that month, having left the premises after a row with Berry, Janice Escalanti was arrested on a prostitution rap, and Berry was charged under the Mann Act with transporting a minor across a state line for immoral purposes. At a trial with strong racist overtones, he was sentenced to three years in jail. So now rock'n'roll was morally bankrupt and commercially discredited in equal proportions. It would not, of course, be kept down. A host of pretenders attempted to replace Presley, such as Ricky Nelson and Ral Donner in the US and Cliff Richard and Marty Wilde in the UK. Their managers followed Colonel Parker's pattern, demonstrating a lack of faith in the music's power to endure. Within months of scoring their first hits, Cliff and Marty could be found appearing in Christmas pantomimes. And, as Ricky Nelson remarked, "When Elvis returned from the army, the competition was rather tough for all young male singers." In Presley's absence, the mood of the music had begun to change. Raw, rockin' rhythm and blues was giving way to the softer sounds of high-school pop: the Teddy Bears' To Know Him Is to Love Him, Frankie Avalon's Venus, the Fleetwoods' Come Softly to Me and Mark Dinning's Teen Angel were topping the US charts. The Twist and Phil Spector's Wall of Sound were on the horizon: great pop music, but built on the contrivance of spontaneity. Something of the original spirit was kept alive by Eddie Cochran's Summertime Blues and the Everly Brothers' Bird Dog, but gradually the music was being repossessed by the professionals who had been pushed aside by the first wave of rock'n'roll. Not that this was necessarily bad news. Some of Presley's finest pre-army records, including Hound Dog and Baby I Don't Care, had been written by Jerry Leiber and Mike Stoller, a pair of smart young Los Angelenos who mastered the art of creating black music for a white audience. 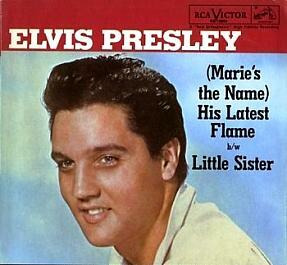 After Presley's return, the gifted team of Doc Pomus and Mort Shuman gave him a series of funky r'n'b-inflected pop songs, including the pairing of His Latest Flame and Little Sister, perhaps the greatest two-sided single in pop history. They symbolised the success with which the New York song factories of the Brill Building and 1650 Broadway, created to feed the public's appetite for musical theatre, were in the process of adapting themselves to the new teen culture. The wilder side of rock'n'roll, represented by Little Richard and Jerry Lee Lewis, may have lost its edge, and the death in a car crash of Eddie Cochran, following that of Holly, represented a costly loss, but pop music neither stood still or regressed while Presley was out of action. As he re-emerged, Leiber and Stoller were writing and producing There Goes My Baby and Save the Last Dance for Me for the Drifters, Carole King and Gerry Goffin were about to give The Shirelles the first ever No 1 hit for a black girl group with Will You Love Me Tomorrow, and Burt Bacharach and Hal David were beginning the collaboration that would produce a string of classics for gospel-trained singers. And in Detroit, Berry Gordy Jr was using his earlier experience as a worker with the Ford Motor Company as he went about the business of building the pop-music assembly line that became Motown Records. No one could look back at this and judge it to be anything other than a miniature golden age. 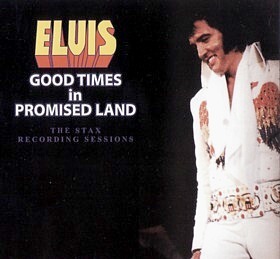 Elvis' own output, despite the need to churn out dismal soundtrack albums to accompany his films, continued to include the occasional gem, particularly for listeners prepared to accept his own breadth of musical taste. 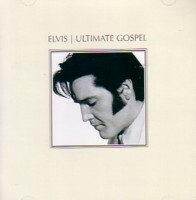 His first album, with its famous cover image of the young rocker in full flight, featured a Broadway standard and country ballads, and a group of songs captured on a home tape recorder in Germany during his army service includes a version of Mona Lisa that is closer to Nat King Cole's suave cocktail-hour version than to the various rockabilly revisions, a straight rendering of Jim Reeves's I'm Beginning to Forget You, and a gospel song, I Asked the Lord, which prefigured his many official recordings of sacred material. And he was clearly enjoying himself with each of them. 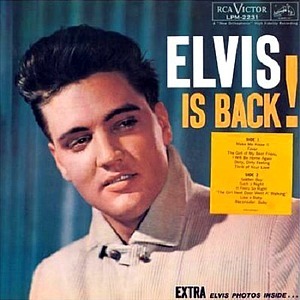 Elvis Is Back, the album resulting from the instant post-demob recording sessions, went a long way to once again re-establishing his credibility with his old fans through a compelling version of the bluesman Lowell Fulson's Reconsider Baby. In the summer of 1960, however, he released a single that created as permanent division among his following. It's Now or Never was an ornately orchestrated rewrite of the classic Neapolitan ballad O Sole Mio, an awfully long way from what purists believed to be his roots in the vernacular music of dirt-poor Tennessee. It prefigured Kitsch Elvis – the Presley of Are You Lonesome Tonight, Wooden Heart, Surrender, Bossa Nova Baby and Viva Las Vegas – and thereafter his music tended to be a highly personal mixture of Nashville, New York and Naples (and occasional detours to Nazareth). Barely two years after Presley's re-emergence, the Beatles and a generation of skiffle-trained British rock'n'rollers came along to inspire the wholesale rediscovery of pop music's disruptive edge and unruly spontaneity, wresting it back out of the hands of the Brill Building songwriters. But nothing had really died when Elvis got his army haircut, and if Lennon is up there somewhere and has a little time on his hands, he might take a listen to the utterly committed, all-stops-out version of Berry's Promised Land that Presley cut with an ace band in the Stax studio in 1973 – still, even in the midst of his Vegas years, the fulfilment of all the promises rock'n'roll ever made. -Copyright EIN March 2010. Do Not reprint or republish without permission. - On his 75th Birthday Elvis Lives On!